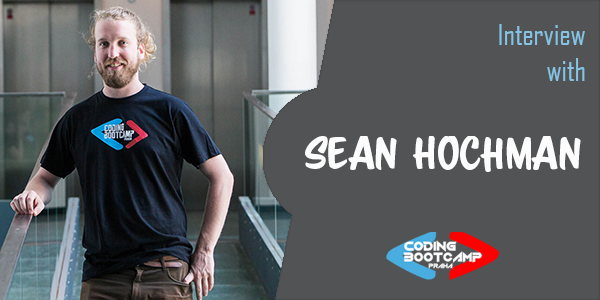 An interview with Sean Hochman, the Spring Batch 2018 graduate of the Coding Bootcamp Praha. Sean Hochman, an American graduate of the Spring Batch 2018, worked as an English teacher in Prague before he started the bootcamp. By January 2019, after months of waiting, Sean finally got his employee card and has just started working for LiveScore.com. If you are a non-EU national, Sean provides some useful tips for you! Read about his experience below. I was an English teacher here in Prague before I started the bootcamp. I had thought about programming for a while, many of my friends who were having trouble finding jobs after college back in America took similar programs back there and ended up getting solid jobs. I studied philosophy and sociology in university, which beyond the point of no return, I realized I had no interest in pursuing any further. I wanted a job that offers unique challenges all the time was definitely something that I was looking for, so programming sort of fits the bill. What made you choose Coding Bootcamp Praha? I randomly met a graduate of the bootcamp at a party. It was a short conversation, not much more than the typical “why did you move to Prague” conversation, but she said she completed the bootcamp and almost immediately found a job. I looked the bootcamp up the next week and signed up immediately. How was your experience at the bootcamp? I have to admit that I underestimated the speed and intensity quite a bit. I, for no good reason at all, assumed that I would pick up on the stuff easily. It wasn’t the case. To be honest, I felt quite behind at certain points of the bootcamp. It wasn’t until a few weeks after the bootcamp, as I continued studying on my own, that I had actually learned SO MUCH. I don’t think I could have gotten to the level I am at on my own; I would get distracted, discouraged, or just lost without the structure and help of the school and the instructors and classmates. Having a group of people you are going through this experience with helps keep you motivated as well. We worked on a variety of projects, so you can really get a good sense of the different aspects of programming, which will help you decide if you want to do front end or back end, etc. All in all, a good experience. What was the biggest challenge during the bootcamp and how did you overcome it? My biggest challenge was just the speed at which the course moved. Falling behind can really cause you compounding issues going forward. I don’t think I really overcame it fully until after the class when I realized that despite the stress, I was still indeed learning so much valuable information and gaining an experience that will serve me in the professional world. What was the most helpful thing that you have learned here? Not to worry about not fully understanding something. People are constantly learning new things in this field: new technologies, new methods, best practices, etc. It's ok not to know everything. How long did it take you to find a job and where do you work today? If you are looking for a career change, and you think you could be happy working on your computer all day, this course will really help jump start your career. It helps give some legitimacy to your programming skills that you might not get if you just study on your own. Aside from that, study the pre-course materials! Like, even more than you think you need to. You will get so much more out of the course if it doesn’t just feel like a constant barrage of overwhelming material. Oh, and if you’re a non-EU person, start getting your visa stuff taken care of as soon as humanly possible. It will save you a lot of headaches following the course when you’re finding a job. You don’t want to wait until you get an offer to start the process, it takes months, lots of visits to embassies and horrifying bureaucratic offices, and it is truly not fun. I'd even recommend hiring someone to help you with the process, which does cost a little bit of money, but it will save you a lot of headaches and be worth it in the end.